The final cover art for Def Leppard's new self titled studio has been revealed along with the release date by Amazon UK. Following last night's running order/song titles reveal by the band in Instagram the album was listed by Amazon's UK site. At first it appeared only initial listings of the CD and a vinyl edition were put up but then the digital version was discovered. The full 14 track digital edition is available to pre order now priced 9.99. The release date that had been mentioned by Vivian Campbell over the last month or so, Friday 30th October, has now been confirmed. As hinted at by the band last night a "special surprise" is due later today/this evening. This is expected to be audio and likely a premiere of the first single. 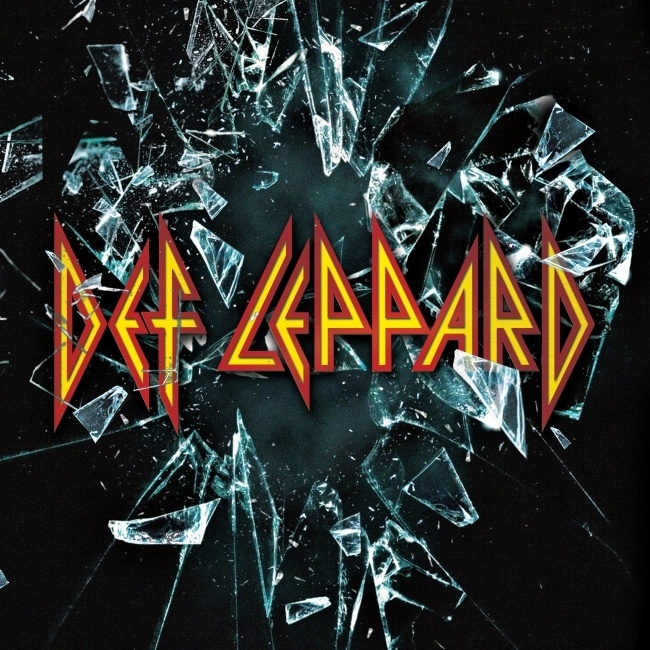 The cover art for the album was also put up on Amazon and is the same shattered glass/classic Lep logo seen on tour posters since February. The Def Leppard logo is prominently placed in the center of the striking image. It's the first time the logo has been placed on a cover in such large font on a studio album since 1999's Euphoria album. A large classic logo was placed in the center of the covers for 2004/2005's compilation albums 'Best Of' and 'Rock Of Ages' with the full album titles placed underneath them. View the tracklisting again below along with the song lengths and total album time as revealed on Amazon. The longest studio album release since 2006's 'YEAH!' which was 55 minutes long. The longest "all-original" studio album since 'Hysteria' in 1987. The various compilation/greatest hits/deluxe editions/live albums are obviously longer. The 'X/Ten' album of 2002 did run for 56:54 on the UK version but that was with two extra tracks, one of which was an acoustic version. Before this 'Euphoria' clocked in at 51:02 mins. The last studio album, 2008's Songs From The Sparkle Lounge, lasted just 39:21 mins.